As media whispered about the biggest press turn out yet I sat happy that I arrived early at the NGV to view From The Sidewalk To The Catwalk, an exhibition by couturier Jean Paul Gaultier. I had managed to grab a seat up close to hear Jean Paul Gaultier, Andreja Pejic and curator Thierry-Maxime Loriot speak. 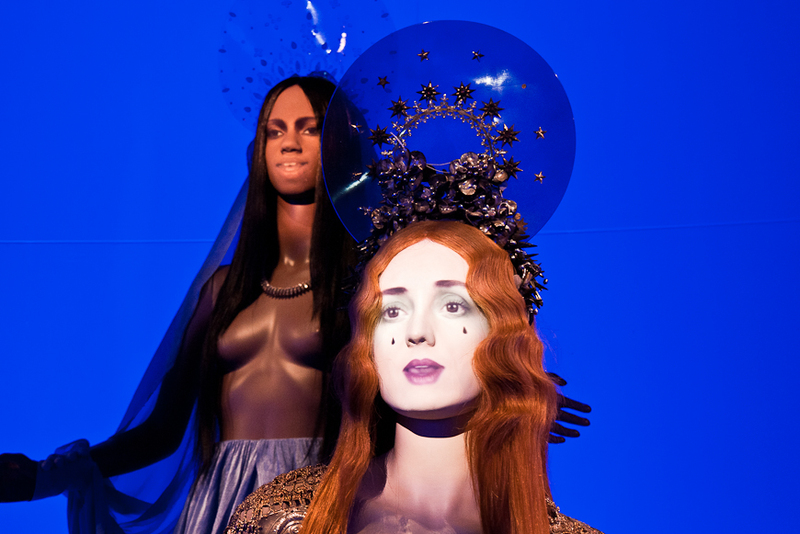 In a room full of guests I noticed an obvious trend of gypsy attirewhich, despite Gaultier having more tendency towards punk, seemed perfectly appropriate as Loriot described the exhibition team (that have travelled to over 7 locations) as a "gypsy family". This "family" bond was obvious as Gaultier, Loriot and Pejic spoke of the concept, the show, and of Gaultier's history. As a speaker Gaultier was charming, energetic and lightly humorous, I found my respect grew ten fold as he had none of my anticipated famous fashion designer arrogance, he appears to be a very down to earth man despite his great successes. "Exhibitions are for dead people" Gaultier proclaimed as he described his initial adversity to the idea of an exhibition, an idea encouraged and developed by Nathalie Bondil, the director of the Montreal Museum of Fine Arts. It was important for him that the exhibition has life and is not only a celebration of his history, but a piece of his ongoing life as an artist. He spoke of how in the past fashion models were there to have beauty, not voices, but how beauty and beauties can speak very well when given the chance. He talked of his diverse model choices and how "the people make the clothes more beautiful", "the importance is the impact they have". This impact is something we have all witnessed in his support of Andrej Pejic, now Andreja Pejic, whose career was launched with the support of Gaultier, which in turn raised awareness and encouraged conversation about the transgender community. As the only venue in Asia Pacific to host From The Sidewalk To The Catwalk, the NGV is puffing its chest with pride, and so its team should. The exhibition, introduced to us as a "Phenomenon" by Bondil is exactly that - a huge celebration divided into themes and themed rooms inspired by years of influence and fascinations. Embracing Gaultier's love of diversity mannequins are of mixed race, gender and body size and most impressively they seem alive with animated faces, speaking, blinking, and occasionally winking.The huge show, which Gaultier and his team say is ever evolving as it travels, features iconic outfits that we all recognise from celebrities such as Madonna and Nicole Kidman, but also showcases photographs, fragrances, illustrations, accessories and film. It is a positively overwhelming display from an artist ( I choose the term "artist" purposefully) who almost seems too young to have such a collection and empire. While we were lucky enough to be able to photograph the event, the photographs do nothing to represent the incredible detailing, craftsmanship and intricacies of the couture pieces, they need to be experienced and viewed, so visit you must! Thanks to Thread.co.nz for sending me along!